To summarise, cycling is good for your overall health here we've shared some of such benefits. Studies commissioned in research labs and universities around the world have come to the conclusion that inculcating a regular habit of cycling boosts brain power and enhances memory retention. The exercise done while cycling helps in the synthesis of new brain cells in the Hippocampus- the area of the brain that is responsible for memory. Also, cycling increases blood and oxygen flow into our brain, which in turn activates the neurons and receptors, thereby increasing the mental capacity. A recent study has established that a person who cycles at least 20 miles a week is at a 50% reduced risk of coronary heart disease. Increased muscle activity requires the heart to pump in blood at a steady rate and hence, enhances cardiovascular fitness. In fact, cycling to work increases cardiovascular fitness by 3-7%. Cycling regularly rids the body of Cortisol, the stress hormone. This exercise, consequently reduces stress and depression substantially and rejuvenates the mind. Mental Stress and lack of sleep are often inter linked. Sleeping even an hour less at night than what is recommended can lead to a significant jump in Cortisol levels. In fact, Stanford University researchers have found out that cyclists are more likely to have a regular and healthy sleep than others and have lesser instances of insomnia. It is also heartening to note that a German study has found that endurance exercises like cycling and a sustained feeling of well being are inter linked. It is worth mentioning that, like swimming, cycling is a wholesome activity which entails the exertion of muscles in different parts of the body, not just the legs. Regular cycling strengthens the leg muscles and enhances the mobility of knee and hip joints. This exercise also leads to increased muscle co-ordination and sustains it over a longer period in our lifetime. Cycling increases calorie consumption and raises the metabolic rate (the rate at which fats and calories are burnt), which can help to lose weight. Sports Physiologists have found out that the metabolic rate remains at a higher state even several hours after cycling. Steady cycling burns upto 300 calories an hour. This translates into a loss of 11 pounds of body weight per year (can you believe that? ), if one cycles for up to 30 minutes per day. A Study commissioned by The National Institute of Health, U.S., has found out that aerobic exercises like cycling can reduce the systolic and diastolic components of our blood pressure by an average of 9 points and 11 points respectively. Now that is quite significant, given the fact that a high blood pressure can lead to diabetes. Thus, cultivating this healthy habit of cycling regularly can reduce one’s susceptibility to diabetes. One can significantly reduce the risk of some forms of cancer by pedaling regularly. Studies have shown that cycling can prevent cancer, especially colon and breast cancer. Chances of bowel cancer also do get reduced. These forms of cancer claim an unacceptably high number of lives every year around the globe. Given this fact, the data released by the New York Department of Transport showing a quantum jump of 289% in the number of bikers in ten years, is a no brainer. When are you joining the bandwagon? Who doesn’t want to be blessed with longevity? Well, a cyclist wouldn’t! Surprised? Now, thats because this habit of his, itself confers him the chance to live longer than his peers. In fact, a study on 2400 identical twins has found out that those who did three 45-minute rides a week, were 9 years ‘biologically younger’ than those who didn’t, thereby delaying the ageing process. Cool, isn’t it? Cyclists are a diverse group. Some of us ride fat tires down rocky trails, some of us ride road bikes up burly hills, some of us ride for sport and some of us ride just for fun. Some ride for the adrenaline rush and some ride their bikes for basic transportation. But all of us can take advantage of the healthy benefits of cycling, even if we never ever buy a single item made from spandex. 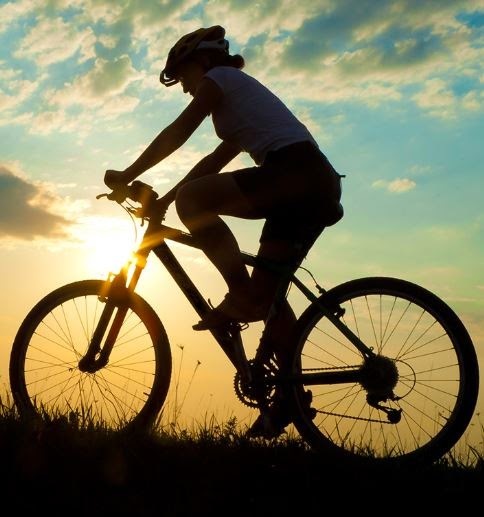 Bicycling, along with being the most efficient mode of human locomotion, is also one of the best all-around activities for improving our health. From head to toes, cycling’s health benefits are hard to beat.